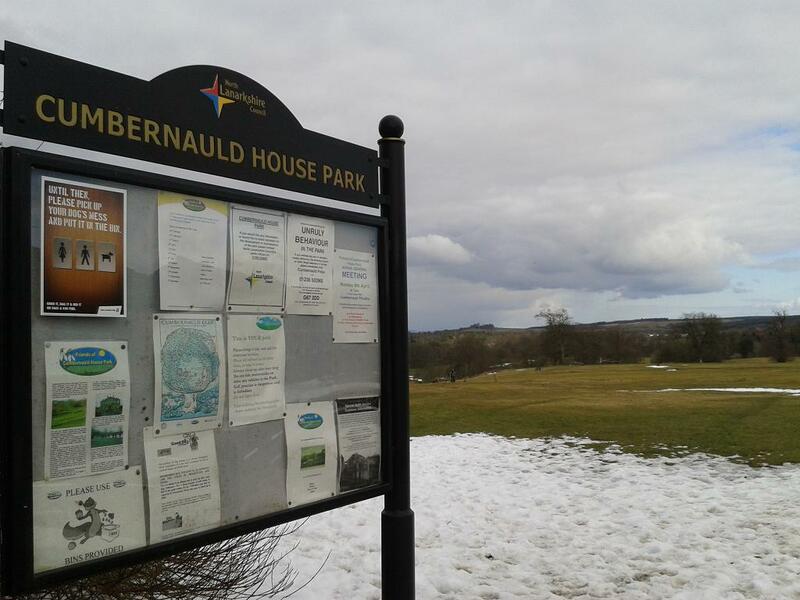 Frustrated community group, the Friends of Cumbernauld House Park, this week demanded action be taken to finalise a car park promised to the area two years ago. When North Lanarkshire Council granted planning permission for the conversion of, grade-A listed, Cumbernauld House, planning conditions clearly stated “the public car park for Cumbernauld House Park users plus access to the car park shall be formed and available for use prior to the occupation of the first residential unit”. The group believes at least one residential unit is now occupied but they are still waiting for the largest town park in North Lanarkshire to have a properly formed car park. The original Design Statement submitted to North Lanarkshire Council for the Cumbernauld House development stated “CHB Developments (Cumbernauld House owners) have proposed that the remaining section of the west yard be designated as public car parking. This would provide approximately 43 public spaces, adjacent to the entrance to the allotments”. The Design Statement also displayed the proposed design for the car park, showing a properly formed car park, with lined spaces, and an overgrown area of planting removed to maximise available space, but none of this has been delivered. Repeated contact between the Friends of Cumbernauld House Park and North Lanarkshire Council have proved to be a waste of time as the car park area remains under the ownership of Cumbernauld House, with the owners unwilling to fulfil their planning obligations and eager for North Lanarkshire Council to take ownership of the land, something they won’t do while in its present condition. North Lanarkshire Council have actually deemed the planning condition to be closed as the area is being used for parking but Adam Smith, Chair of the Friends of Cumbernauld House Park, said “The only reason the car park area is being used is because there is nowhere else to for the users of Cumbernauld House Park to leave their vehicles. 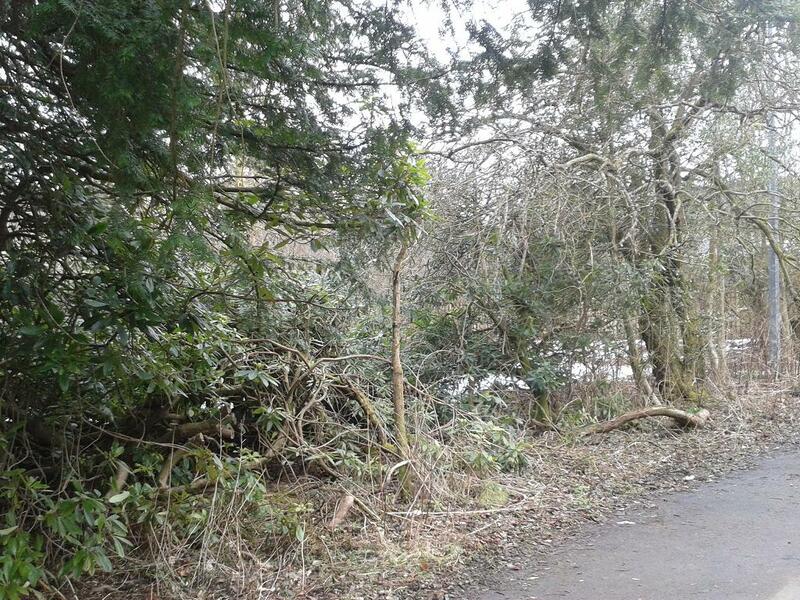 The car park area is in an incredibly poor condition and; with inadequate lighting, trip hazards, and dense woodland; is a danger to personal safety. 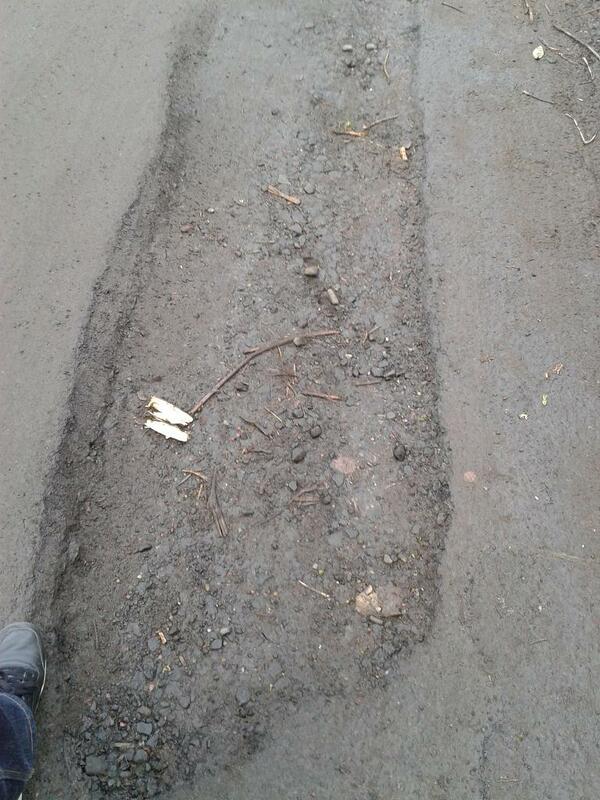 The access road is also riddled with potholes and presents a risk of serious damage to vehicles and the potential for injury. We need this car parking area, and the access road from the Wilderness Brae, to be upgraded to a reasonable standard as soon as possible, and we will be discussing this at our next meeting and AGM, which will take place on Monday 8th April at 7pm in Cumbernauld Theatre”. Another planning condition states that directional signage to the car park “shall be erected prior to the occupation of the first residential unit”. Until recently, the only signage in place was a faded piece of wood nailed to a tree. This has since been removed and now leaves no signage at all. This appears to be another planning condition which the Cumbernauld House owners have failed to carry out and which North Lanarkshire Council have failed to enforce. 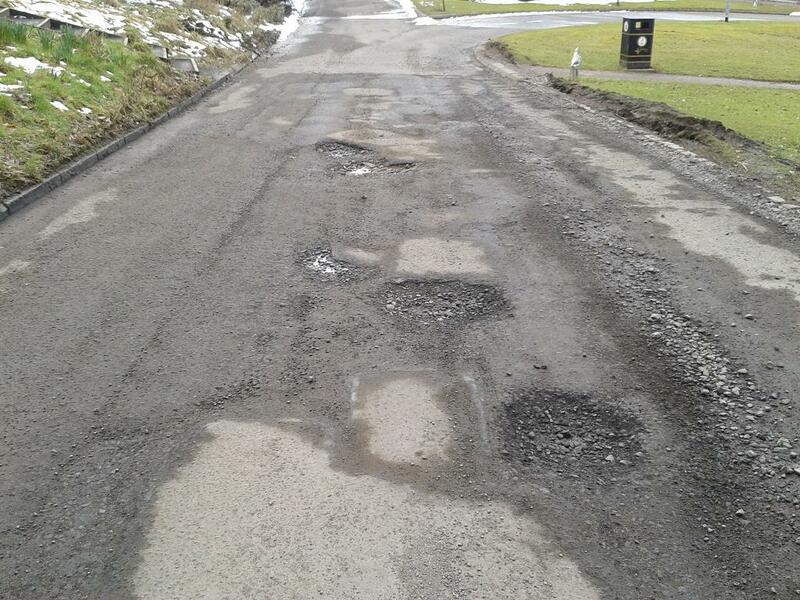 In November last year, the Scottish Public Services Ombudsman upheld a complaint against North Lanarkshire Council for having failed to enforce planning conditions set on a residential development requiring the upgrading of an access road, and it appears North Lanarkshire Council may not have learned their lesson from previous mistakes. A recent Cumbernauld News article stated that our plans for a Community Archaeology project wasn’t feasible. Unfortunately the Cumbernauld News didn’t approach ourselves for a comment on the article and the below letter was submitted to them for publication in the next edition. Last week’s Cumbernauld News reported on comments by John Kirkhope, a local architect, under the headline “Archaeological dig ‘unlikely to be a success’”. As Chair of the Friends of Cumbernauld House Park I was disappointed to read these comments from someone who has not attended any of our meetings or made any attempt to contact the group to find out more about our plans for a community archaeology project. We hope to deliver a professionally supported, community-led archaeology project to investigate the former Cumbernauld Castle, delivered in an education and training environment with input from schools, community groups, and local individuals. We have taken advice from two professional archaeology firms, spoken with the Heritage Lottery Fund, and discussed the matter with North Lanarkshire Council, all of whom fully support our project. We are delighted that the community have already shown great interest in our plans, with attendances at our monthly meetings having increased as a result and, despite the comments made last week, we will be pressing ahead with our attempts to develop a community archaeology project to investigate and explore the ruins of the former Cumbernauld Castle. Anyone who wants to find out more about the project, and about the work of the Friends of Cumbernauld House Park, is welcome to attend our next meeting and AGM on Monday 8th April in Cumbernauld Theatre at 7pm. Tomorrow the Friends of the Glen are having a fun day in the park. We’ll be there to help. All welcome. We are disgusted today to report that some mindless morons have pulled out about 2 dozen of the new saplings we planted earlier in the year. No idea why people think this is funny or acceptable. It is a real shame that some of the kids who planted these trees will not see them grow to their potential. Do people not get taught community spirit anymore? I am sure the kids will be disappointed when they next visit their trees. It’s a real shame that the warm weather always brings out this type of behaviour as this is the time that people should be getting the most out of the park. We’d love to track down the culprits but as there is no way to police the park 24 hrs a day it’s impossible. The thought that going into the park, drinking too much and wrecking the very space that your own townspeople and neighbours (not the council to be clear) have worked hard on all year is a good way to spend your time is a complete mystery to most clear minded folk. Let’s hope the culprits have a think to themselves and perhaps feel a little guilt about the town they have let down. I think we can consider 2011 to have been quite a good year for the Friends of Cumbernauld House Park. We completed the interpretive signs project and it seems that they have been broadly welcomed by the local community. Furthermore, they have not (yet) been subject to any damage by vandalism. 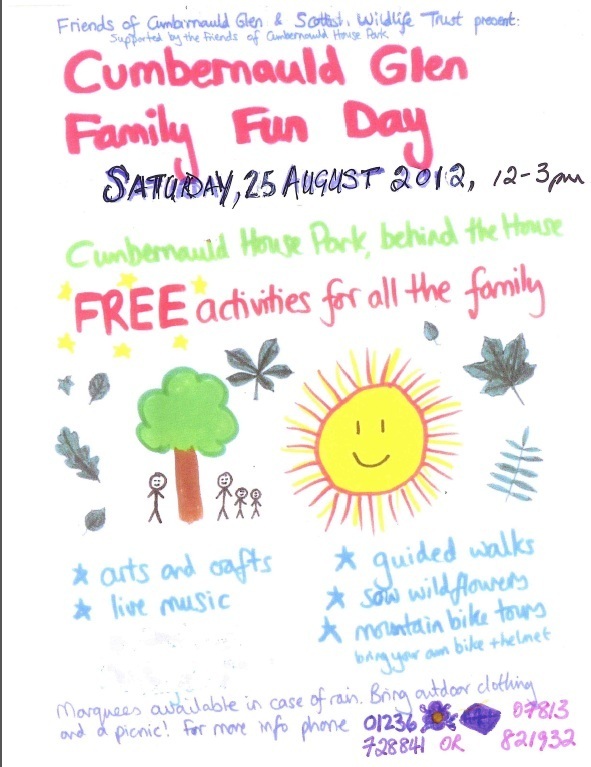 We had a successful Fun Day, our first joint project with the Friends of Cumbernauld Glen. 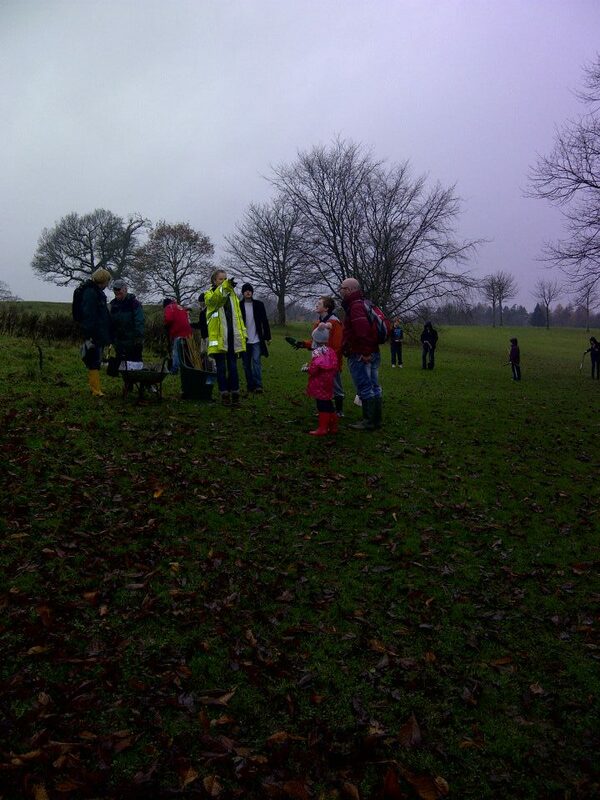 We obtained 420 young saplings, free of charge, from the Woodland Trust and we had three successful planting sessions, two of which involved several members of the local community. Hopefully they will all grow to maturity over the next 10-20 years and will add to the diversity of the park. A small number of saplings (including Ann’s Royal Tree) have been kept for planting in the early spring. Thanks to Kevin’s efforts on our behalf, North Lanarkshire Council have obtained five standard trees (around 2 metres high) to be planted in the park and we have marked out the places for them to be planted. The NLC squad are waiting for a suitable break in the weather for them to actually plant the trees. Sadly, high winds have brought down a few trees in the park and NLC is , as yet, to clear away all the fallen timber. Despite our disappointment that Cumbernauld House has been lost to community use, it is pleasing to see work progressing on the conversion of the house and its outbuildings into housing units. (Almost) Anything is better than it lying empty and prone to vandalism! On the down-side, we have, as yet, been pretty unsuccessful at recruiting new members to our group. This will become more of a probleman a couple of months time, when Beth and Gordon, two of our most active and enthusiastic members, will be leaving Cumbernauld for a new life overseas. We all wish them well, but the rest of us will need to do our best to recruit (at least )two new members to replace them!